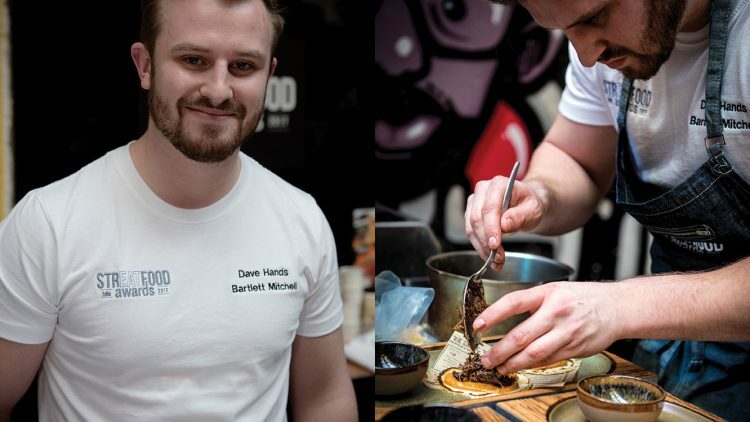 Dave Hands talks in b&i catering magazine about why he entered the street food awards and what he believes is next in this growing market. Why did you enter the awards? I entered the awards to challenge myself and see how I would compare against other caterers who love making street food. Street food is probably one of the things I enjoy cooking the most at work and home, so I was quite excited to enter. When I was planning my menu I looked at what street foods were newly trending in London and how I could adapt them to suit my style of cooking. I also looked at what I thought everyone else might choose to give me a better chance in the competition, I wanted it to be different, and do something that nobody else would. I chose to do a triple pork taco for my signature dish at the competition, this was comprised of BBQ Pork cheek, chipotle and bacon mayo and pork skin puffs, with red cabbage and pickled coriander seeds. I also wanted to be able to make my own tacos at the competition instead of using pre made, so I had to learn how to use masa and the technical aspect of cooking them – this was quite challenging. How do you stay calm under pressure? I think that the best way to stay calm under pressure is to do everything you possibly can before the event. I practiced my dish so many times that I knew exactly what I was going to be doing, how long it would take and how it was going to be presented. I think when you’re properly prepared, it’s just dealing with the environment on the day. Why has street food become so popular? Street food is a quick, easily accessible form of food which, in the majority, is packed full of flavor. It is also incredibly satisfying and most of the time affordable so you might be able to enjoy a number of dishes at a single event. I think people are enjoying being able to combine a night out with different and decent food & drink without having to pay a premium or having to wait months to get a table. How do you get street food onto your menus at work? At Bartlett Mitchell, most of our larger restaurants have a whole section of the menu dedicated to street food. In our restaurant, we use themed theatre bars or counters to showcase street food from different regions. For example, we might have an Asian themed pop up where we will do steamed bao buns, or even fusions like Korean fried chicken tacos. What effect has it had on contract catering? I think contract caters have realised that street food is a massive market, with so many different avenues in terms of food, marketing, pop ups – there really is something for everyone’s tastes. I think it’s also exciting for chefs who might not have had any experience in street food to learn new skills and flavours. Did you enjoy the competition? I really enjoyed the competition and thought It was a great venue and was great to be so up close with the spectators. Usually competitions are held in large open spaces with no atmosphere and they feel very impersonal. What’s next in the world of street food? I think so many street food concepts have been covered in London with the common things like burgers, tacos, fried chicken & BBQ being done so well by so many. I think dirty vegan/vegetarian street food will start becoming more prominent. I think to take a vegetable based dish and turn it into something that gives you the same satisfaction as a big hunk of meat will lure in even the most carnivorous of people.